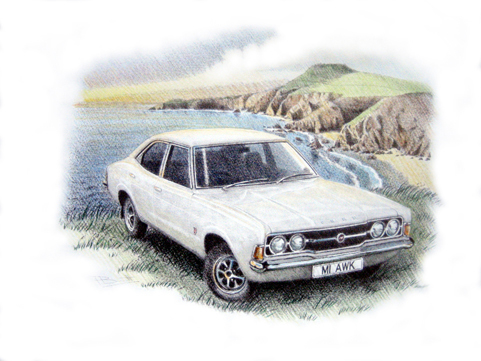 Here at Classic Memories the British automobile artist Paul Bennett GMA has gathered together a huge portfolio of his artwork and can now offer you the chance to purchase a totally unique presentation mounted print of your car taken directly from one of his hand drawn illustrations complete with your very own PERSONALISED registration. Paul has been a professional illustrator for over 40 years and his highly distinctive and most unique of styles has ensured his work sells to collectors worldwide with over 70,000 of his illustrations and personalised prints sold to date. He became a member of the prestigious Guild of Motoring Artists in 1998. There are also many digitally produced illustrations in stock these days. These have been specifically produced to customers requirments concerning a particular car I haven't hand drawn. Once done for a customer they are added to the portfolio of prints offered for sale. along with one of the artists personally hand coloured examples.